A set of two Evoland series titles that pay tribute to iconic productions and showcase the evolution of video games over the years - from the eight-bit era to the level of performance of the PlayStation 2 era. 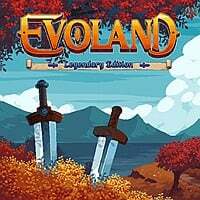 Evoland Legendary Edition is a compilation of two original productions from the borderland of RPGs, action games and adventures. Behind their development is the independent Shiro Games studio, which also has a warmly received Northgard game in its portfolio. While the idea for the first installment of the Evoland series was born during the Ludum Dare 24 game jam, the second part of the series was created from the beginning as a commercial product. Both items in the Evoland Legendary Edition are based on a similar scheme, showing the evolution of video games, while at the same time paying tribute to cult titles through a variety of references. At the beginning of the game, the productions offer simple, two-dimensional graphics, and the hero, in which the player plays, has a very limited range of moves. However, as we progress, we are gaining improvements that affect both the audiovisual sphere and mechanics. Among them there are, for example, puzzles, more and more complex combat system (apart from real-time clashes we have to take part in turn-based battles, and in Evoland 2 - also duels taken out directly from the fighting games) or even more diverse adversaries (headed by powerful bosses). As mentioned above, the gameplay of the Evoland Legendary Edition compilation evolves in front of the player's eyes. Initially we are dealing with a monochromatic pixel art, but with time the whole thing gains details, in the end enjoying the look from the PlayStation 2 era. Along with the changing visual sphere goes more and more complex sound layer.